my father, Louis Winitsky. For over a century, fabrics and Fourth Street have been interwoven. Many of the Jewish immigrants who settled there around the turn of the twentieth century were tailors or seamstresses. Working long hours in sweatshops, they produced the clothing that made Philadelphia the leading men's apparel manufacturer in the world. 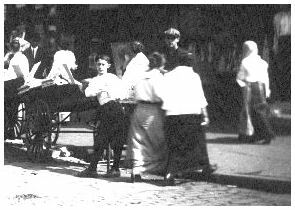 Other Jewish immigrants on Fourth Street included peddlers who hawked dry goods like fabric remnants, sewing supplies, sheets and curtains. They worked out of pushcarts that lined the streets, or from stands -- tables made of boards and sawhorses -- that leaned against the storefronts. Eventually, they opened up fabric stores, mainly in the 700 block between Bainbridge and Catherine streets. Today, the pushcarts are gone, as are many of the old fabric establishments. Still, a number of them remain, along with a new generation of entrepreneurs, and a new name for the area -- Fabric Row. 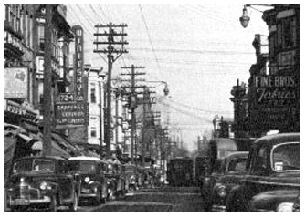 photo courtesy of the Philadelphia City Archives Known in Yiddish as "Der Ferder" (the Fourth), South Fourth Street was a bustling marketplace, a lifeline that ran through the immigrant Jewish community, from Lombard Street to Washington Avenue. 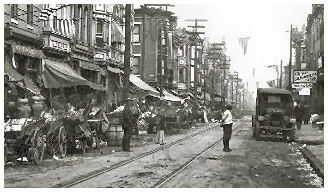 Besides dry goods and fabric businesses, it included dozens of kosher butcher shops, fish stores, and dairy stores, plus hundreds of fruit and vegetable carts and stands. "Our neighborhood includes ... Fourth Street, Philadelphia's closest approach to New York's lower East Side, where we have the pushcarts, crowded streets and pavements, the open air display of calico, candy, pickles and fish for sale... Ours is an economically but not a morally depressed neighborhood." One of the oldest fabric related businesses still on Fourth Street is Marmelstein's, a home decorating and bridal accessories shop, which began in 1919. "Actually, [the business] started with just a little suitcase with thread, needles, thimbles... [My parents, Abraham and Dora Marmelstein] had a stand. They were out in all kinds of weather. They sold notions and trimming... They lived at 769, 751, 733, then back to 751, then eventually across to here . So all of us have spent our lives on this street." By the 1920's, many of the peddlers and stand keepers had moved up the business ladder into dry goods and fabric stores. Tailors and dressmakers came from all over the city to buy fabrics from them. Stapler's Fabrics, which began on a pushcart, was already a well established business. Like most of the fabric stores, it was family run, with every member of the family participating. "The entire family, including all the sisters, were in the business. There were eight all together, and the whole life revolved around that store. They lived up above. My father would say he lived on the roof! But they ate and slept and drank there. Everything was done in that store... [My mother] met my father [there]. Her mother took her there to have her clothes made, and that's how they met." Because merchants lived above their stores, they often kept long hours. "We stood open seven days a week, even till eleven, twelve o'clock at night. We never went to sleep." Fourth Street didn't feel the effects of the Depression as much as other areas because people bought fabrics to sew their own clothes. "The fabric stores survived in the Depression. They worked on a close markup. I'm not saying they made fortunes, but the stores were busy... People couldn't afford to buy clothes, so they made them.. If you didn't know how to sew, you learned how." "There were always customers on Fourth Street." To further promote trade, a business association was established. "On August 15, 1933, South Fourth St. Business Merchants gathered together at the Talmud Torah, 314 Catherine Street for the purpose of discussing the possibilities of an Association for our purposes along south Fourth St. in the vicinity of Washington Ave. to South St.... Upon motion duly made and seconded, it was resolved that the body of men be known as the South Fourth Street Business Men's Association." For many merchants, World War II proved to be more challenging than the Depression. Because fabric manufacturers were supplying the armed forces, it was difficult to keep the stores stocked. "I used to commute to New York every day [to find fabrics]." "We used to close a lot because we didn't have the merchandise, and we weren't going to pay black market prices." "You had lines of people waiting for fabric." Moreover, the stores had to close Tuesdays and Thursdays at 6 p.m. to conserve electricity. According to Gertrude Zubrow Gubernick, her father, Nathan Zubrow, had a fire alarm bell hooked up to a light switch in his store. At 6 p.m. he rang the bell as the signal for the shops to close. Sometimes a storekeeper asked him to hold off ringing the bell -- if he was in the middle of a sale -- or to ring it early, so a non-buying customer wouldn't go to a competitor! The war was hard on the Jewish merchants for other reasons, too. They worried about their sons in the army, and about the fate of relatives still in Europe. "The Holocaust was an emotional drain on my parents. They both had left large families behind." After the war, life on Fourth Street changed dramatically. Post-war prosperity meant fulfilling the American dream of a house in the suburbs. Merchants who had once lived above their stores now commuted to work. 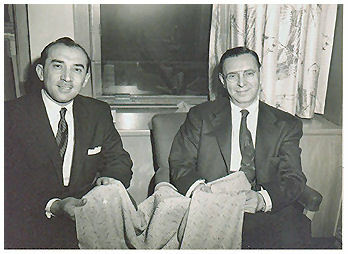 Because of the post-war building boom, people began buying more home decorative fabrics. To go along with the trend, many stores shifted their merchandise from dress fabrics and ready-made curtains to decorative fabrics. "[Everyone] had new homes and ... enough money, and they wanted everything decorated." "Most people went into custom-made -- the heavy draperies with the sheers underneath, wall-to-wall, the whole works." "People knew the name 'Silk Leaders,' so when we went into the drapery business, [we] just never changed it. People come in here all the time saying, 'Where are your silks?' 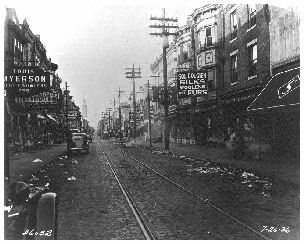 "
There was a new level of sophistication on Fourth Street after the war. A few businesses expanded into wholesale as well as retail trade. These included Rosenblitt's ( Roseline Fabrics) and Winitsky & Co. (Win-tex Fabrics). 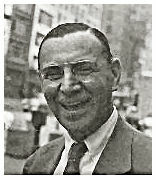 Merchants like Samuel Goldberg went on buying trips around the world. And in the 1950's, pushcarts were outlawed. "[Some] people thought the end of the world was coming when the pushcarts left...[Instead] it really lifted the level of customer and sale on the street." "Fourth Street is still known all over the United States... You build a reputation." 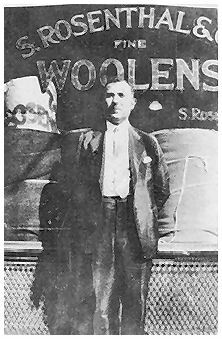 photo, left: Samuel Rosenthal sold woolens here at 747 South Fourth Street from 1917 until the early 1930's when he moved his business to Fifth Street. By then, Fourth Street was specializing in ladies' silks and woolens, while Fifth Street specialized in men's woolens. Rosenthal's is now a third generation business. Notes: Unless otherwise indicated, all quotes are from oral histories the author conducted from 1997-1998. Family Finder: Seeking information on Leon H. Hahn: He was in the dry goods business in Philadelphia before and after WWII. Contact Bill Meyers at BPMeyers@aol.com . Were your parents or grandparents in the fabric business on Fourth Street? The Fabric Museum would be pleased to add photos of them and/or their store to the Fourth Street Family Album. Send photos, comments, and any questions to: mpalmer@fabricmuseum.org . Reproduced courtesy of "The Fabric Museum," Michele Winitsky Palmer.